The Oceanis 48 is a Benneteau sailboat providing you with a comfortable, reliable and relatively fast sail, you will discover all the wonders of the Canary Islands such as Gran Canaria , Tenerife, Fuerteventura , Lanzarote , La Palma, El Hierro . Situated in Gran Canaria, Canary Islands, this Oceanis 48 (5 double cabins), built in 2015 by Beneteau, is capable of hosting up to 12 pax. Further more, and for a better bareboat charter experience, Oceanis 48 is equipped with bow thruster, electronic on board, equipped galley and also CD. 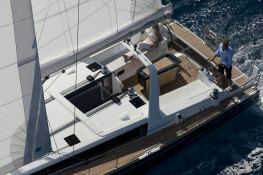 This sailing yacht is available for charter starting from 1 995 € (approximatly 2 250 $).